An in-depth report on the causes, diagnosis, treatment, and prevention of lupus. What is Systematic Lupus Erythematosus (SLE)? SLE or lupus is an autoimmune disease that causes a chronic inflammatory condition. The inflammation triggered by SLE can affect many organs in the body, including skin, joints, kidneys, lung, and nervous system. Women (especially African American and Asian women) have a higher risk than men for developing SLE. SLE has a wide range of symptoms. The most common initial symptoms are joint pain, skin rash, and fever. Symptoms can develop slowly or appear suddenly and can include manifestations of lupus effects on kidney, brain, or other organs. Many patients with SLE have "flares," in which symptoms suddenly worsen and then settle down for long periods of time. Diagnosing SLE is complicated because symptoms vary widely and can resemble other conditions. A doctor will base an SLE diagnosis on certain specific criteria including symptom history and the results of blood tests for specific autoantibodies. No drug can cure SLE, but many different drugs can help control symptoms and relieve discomfort. The choice of drugs depends on the severity of the condition as well as other factors. Patients with mild SLE may be helped by nonsteroidal anti-inflammatory drugs (NSAIDs) while patients with more severe SLE may require corticosteroids or other drugs which change or modify the body's immune system. Researchers are working to develop new drugs and treatments for SLE. because the disease can affect organs and tissue throughout the body. is Latin for wolf. It refers to the rash that extends across the bridge of the nose and upper cheekbones and was thought to resemble a wolf bite. is from the Greek word for red and refers to the color of the rash. Refers to lupus that is confined to the skin and does not affect other parts of the body. About 10% of people with this type of lupus go on to develop SLE. A type of cutaneous lupus that produces a potentially scarring disk-shaped rash on the face, scalp, or ears. A temporary and mild form of lupus caused by certain prescription medicines. They include some types of high blood pressure drugs (such as hydralazine, ACE inhibitors, and calcium channel blockers) and diuretics (hydrochlorothiazide). Symptoms resolve once the medicine is stopped. A rare condition that sometimes affects infants born to mothers who have SLE. Babies with neonatal lupus are born with skin rash, liver problems, and low blood counts and may develop heart problems. 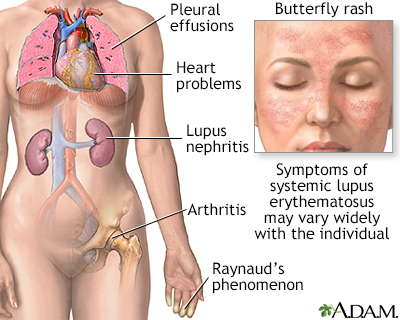 Systemic lupus erythematosus (SLE) is an autoimmune disorder. In a normal immune system, the body produces proteins (antibodies) to fight viruses, toxins and other potentially harmful substances (antigens), which are typically foreign or nonself. With lupus and other autoimmune diseases, the immune system does not work properly. It produces autoantibodies that mistakenly target the body's own healthy cells and tissues. These autoantibodies also trigger inflammation, which can lead to organ damage. Scientists do not know exactly what causes the abnormal immune response associated with autoimmune disorders. The cause is most likely a combination of genetic and environmental factors. People who develop an autoimmune disease may have a genetic predisposition that is triggered by some environmental factor such as sunlight, stress hormones, or viruses. It does not appear that one gene alone is responsible for lupus. Researchers estimate that 20 to 100 different genetic factors may make a person susceptible to SLE. About 90% of lupus patients are women, most diagnosed when they are in their childbearing years (20s and 30s). (Female hormones may play a role.) Men are at higher risk for lupus before age 18 and after age 50. Most people develop SLE between the ages of 15 to 44. About 15% of patients experience the onset of symptoms before age 18. African Americans are three to four times more likely to develop the disease than the white people and to have severe complications. Hispanics, Asians, and Native American women are also more susceptible to the disease. Lupus very often runs in families but people without a family history of lupus can also develop it. Lupus is also more common in families whose members have other autoimmune disorders. Scientists identified several common genetic variants associated with SLE, most of which are immune system genes. In addition, rare mutations in a few genes are associated with a high risk for lupus or lupus-like syndromes. In genetically susceptible people, there are various external factors that can trigger symptoms (flares). Sunlight (UVB) is considered a definite SLE trigger. Additional possible SLE triggers include colds and other infections, fatigue, stress, smoking, chemicals, and certain drugs. Some research suggests an association between Epstein-Barr virus (EBV), the cause of mononucleosis, and increased risk for lupus. Other viruses or infections can also trigger SLE. Ultraviolet (UV) rays found in sunlight are important SLE triggers. UV light is categorized as UVB or UVA depending on the length of the wave. Shorter UVB wavelengths cause the most harm and are also associated with triggering symptoms of SLE. Emotional or physical stress can trigger SLE flares. Smoking is a potential flare trigger as well as a risk factor for SLE. Smoking can increase the risk for skin and kidney problems in women who have the disease. Long-term heavy smokers are at highest risk. While no chemical has been definitively linked to SLE, occupational exposure to crystalline silica has been studied as a possible trigger. Some prescription medicines (hydralazine, methyldopa, penicillamine, minocycline, and others) are associated with a temporary lupus syndrome (drug-induced lupus), which resolves after these drugs are stopped. Premature menopause, and its accompanying symptoms (such as hot flashes), is common in women with SLE. Hormone replacement therapy (HRT), which is used to relieve these symptoms, increases the risk for blood clots and heart problems as well as breast cancer. It is not clear whether HRT triggers SLE flares. Women should discuss with their doctors whether HRT is an appropriate and safe choice. Guidelines recommend that women who take HRT use the lowest possible dose for the shortest possible time. Women with SLE who have active disease, antiphospholipid antibodies, or a history of blood clots or heart disease should not use HRT. Female patients with lupus used to be cautioned against taking oral contraceptives (OCs) due to the possibility that estrogen could trigger lupus flare-ups. However, recent evidence indicates that OCs are safe, at least for women with inactive or stable lupus. In addition, women who have a history of, or who are at high risk for, blood clots (particularly women with antiphospholipid syndrome) should not use OCs. The estrogen in OCs increases the risk for blood clots. Systemic lupus erythematosus (SLE) can cause complications throughout the body. Blood problems are common with SLE. Hemolytic anemia can occur with very high levels of the anticardiolipin antibody. It can be chronic or develop suddenly and be severe (acute). Vasculitis is an inflammation of the blood vessels. If it becomes severe, it can cause blood to stop flowing to organs and tissues, resulting in damage to the tissue and potentially life-threatening complications. In thrombocytopenia, antibodies attack and destroy blood platelets. In such cases, blood clotting is impaired, which causes bruising and bleeding from the skin, nose, gums, or intestines. These conditions cause a drop in the number of white blood cells. Severe reductions in white blood cell counts can increase the risk for infections. Patients with SLE and other autoimmune disorders have a greater risk of developing lymph system cancers such as Hodgkin disease and non-Hodgkin lymphoma (NHL). The risk for coronary artery disease, heart attack, and stroke is much higher than average in patients with SLE, and heart disease is a primary cause of death. The chronic inflammation associated with SLE can cause plaque buildup (atherosclerosis) in the heart's arteries, which can lead to coronary heart disease and heart attack. SLE also affects blood vessels and circulation. In addition, SLE treatments (particularly corticosteroids) can affect cholesterol, weight, and other factors that harm the heart. A common problem is inflammation of the membrane lining the lung, which can cause shortness of breath and coughing. Accumulation of fluid in the lungs. 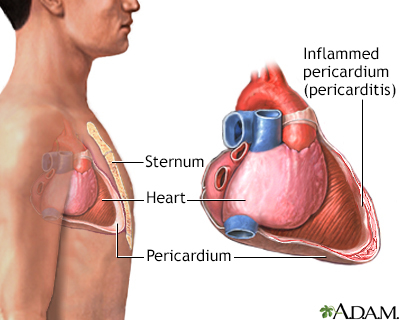 Inflammation of the lung tissue, which can be acute (short-term) or chronic (long-term). Symptoms include chest pain, difficulty breathing, and a dry cough that may bring up blood. Lupus pneumonitis may cause scarring of lung tissue. Fortunately, this condition is relatively rare. Another serious but rare condition. It occurs when high pressure develops in the pulmonary arteries as a result of damage to the blood vessels of the lungs. in the lungs (pulmonary embolism) can travel from deep veins in the legs. This problem is linked to the antiphospholipid syndrome (APS). Kidney complications such as inflammation of the kidneys (lupus nephritis) are common in SLE and are a significant cause of morbidity and mortality in lupus. About one third of patients have lupus nephritis at the time of diagnosis and more than one half develop it within 10 years after lupus symptoms begin. In its early stages, lupus nephritis can cause fluid buildup leading to swelling in the extremities (feet, legs, hands, arms) and overall weight gain. Lupus nephritis may progress to kidney failure (end-stage renal disease), a severe condition that requires lifelong treatment with hemodialysis or even kidney transplant. Periodic screening for kidney disease is important for all patients with SLE. Nearly all patients with SLE report some symptoms relating to problems that occur in the central nervous system (CNS), which includes the spinal cord and the brain. SLE can also affect the peripheral nervous system, which transmits and receives motor and sensory information from the central nervous system. Symptoms vary widely and may overlap with psychiatric or neurologic disorders. They may also be caused by of some medicines used for treating SLE. Problems with thinking, concentration and memory, commonly known as "lupus fog." Problems with the reflexes, sensation, vision, hearing, and motor control. These abnormalities can be due to inflammation in the cranial or peripheral nerves or in the spinal cord itself. CNS vasculitis is a serious but very rare disorder caused by inflammation of the blood vessels of the brain. Strokes can be due to the APS. Infections are a common complication and a major cause of death in all stages of SLE. Patients are not only prone to the ordinary bacterial and viral infections, but they are also susceptible to fungal and parasitic infections, which are common in people with weakened immune systems. They also face an increased risk for urinary tract, herpes, salmonella, and yeast infections. Corticosteroid and immunosuppressant drug treatments used for SLE also increase the risk for infections. Many patients with SLE suffer gastrointestinal problems, including nausea, weight loss, mild abdominal pain, diarrhea, and gastroesophageal reflux disorder (heartburn). SLE can also affect organs located in the gastrointestinal system, such as the liver, gallbladder, pancreas, and bile ducts. Patients with SLE often experience muscle aches and weakness. Lupus can also cause pain, stiffness, and swelling in the joints. Lupus arthritis varies in severity from mild to deforming. Knees, wrists, and the small joints of the hand are most commonly affected. Patients with SLE also commonly experience reductions in bone mass density (osteoporosis) and have a higher risk for fractures, whether or not they are taking corticosteroids (which can increase the risk for osteoporosis). Women who have SLE should have regular bone mineral density scans to monitor bone health. Many patients with SLE have problems with dry eyes. Retinal vascular lesions (blood vessel damage due to reduced blood flow) are also common and may affect vision. Nerve damage in the eyes can also cause poor vision as well as droopy eyelids. It is not uncommon for patients with SLE to also have Sjögren syndrome, another type of autoimmune disorder characterized by dry eyes. Certain antimalarial drugs, especially hydroxychloroquine, used to treat SLE can also cause eye complications. Women with lupus face a higher risk for pregnancy complications, including miscarriage, premature birth, and preeclampsia. The risk for miscarriage is highest for patients with antiphospholipid antibodies, which can cause blood clotting in the placenta. Lupus patients with active kidney disease are at increased risk for preeclampsia (a pregnancy complication that includes high blood pressure and fluid buildup). Pregnant women who take corticosteroids face increased risks for gestational diabetes and high blood pressure. SLE is a chronic and relapsing inflammatory disease. It is marked by periods of remission (no symptoms) that alternate with flares of active disease when symptoms suddenly worsen. In women, flares tend to diminish after menopause. Symptom-free periods can sometimes last for years, but the course of SLE is unpredictable and varies greatly from person to person. Some patients have a mild form of lupus with occasional skin rashes, fever, fatigue, or joint and muscle aches. Sometimes lupus remains in a mild form, other times it may progress to a more severe form. Severe lupus involves serious health complications and extensive internal organ damage (such as the heart, lungs, kidneys, and brain). Because of more effective and aggressive treatment, the prognosis for SLE has improved markedly over the past two decades. Treatment early in the course of the illness that controls the initial inflammation can help to improve long-term outlook. Over 95% of people with lupus survive at least 10 years, and with appropriate follow-up and treatment most patients can have a normal lifespan. SLE symptoms may develop slowly over months or years, or they may appear suddenly. Symptoms tend to vary among patients and different symptoms can occur at different times. Joint pain and stiffness, which is often accompanied by swelling and redness. The joints most affected are fingers, wrists, elbows, knees, and ankles. Skin rash, including the characteristic "butterfly rash" on the face that extends over the bridge of the nose and cheeks. Rash can also appear on other parts of the face or other skin areas that are exposed to sun. Symptoms of lupus nephritis -- swelling (edema), abnormal urine color or foaming, high blood pressure. Symptoms of neuropsychiatric involvement: cognitive problems, depression, stroke, seizures, neuropathy. Brittle hair or hair loss (alopecia). 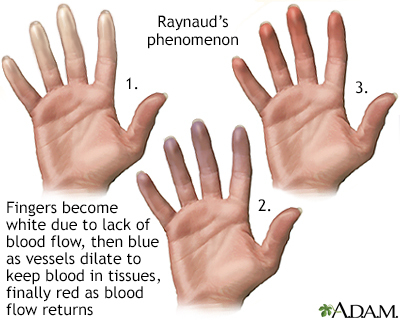 Painful, pale or purple fingers or toes triggered by cold or stress (Raynaud phenomenon). Hardening of the skin caused by overproduction of collagen. Inflammation of the lining of the joints. Characterized by dry eyes and dry mouth. Similar to SLE, but milder. Inflammation and degeneration of muscle tissues. Flushed face with pus-filled blisters. Sores on lips and nose. Swollen rash that itches, typically on scalp, arms, legs, or in the mouth. Bluish-red skin eruptions on face and upper body. Bulls-eye rash, joint inflammation, and flu-like symptoms. SLE can be difficult to diagnose. Symptoms can fluctuate and mimic those of other diseases. A doctor will make a diagnosis of SLE based on symptoms, medical history, physical exam, and blood test for antinuclear antibodies. The doctor may also order other types of laboratory tests. The American College of Rheumatology (ACR) has a classification system for helping doctors diagnose, or exclude, SLE. According to the ACR, at least 4 of the 11 criteria should be present for a diagnosis of lupus. A patient must experience four of the criteria before a doctor can classify the condition as SLE. These criteria, proposed by the American College of Rheumatology, are not exclusive criteria for diagnosis, however. A primary test for SLE checks for antinuclear antibodies (ANA), which attack the cell nucleus. ANA is reported as a "titer". Low titers are in the range of 1:40 to 1:160. A positive ANA test is much more significant if you also have antibodies against the double-stranded form of DNA. Antinuclear antibodies may be strongly present in other autoimmune diseases (such as scleroderma, Sjögren syndrome, or rheumatoid arthritis). They also may be weakly present (low titer) in about 20 of healthy women. The incidence of positive ANA in healthy individuals increases with age. Some drugs can also produce positive antibody tests, including hydralazine, procainamide, isoniazid, and chlorpromazine. A negative ANA test makes a diagnosis of SLE unlikely but not impossible. High or low titers of ANA also do not necessarily indicate the severity of the disease, since antibodies tend to come and go in patients with SLE. If SLE-like symptoms are present and the ANA test is positive, other tests for SLE will be done. If SLE-like symptoms are not present and the test is positive, the doctor will look for other causes, or the results will be ignored if the patient is feeling healthy. Doctors may also test for autoantibodies to specific nuclear antigens (ANA subtypes). Anti-double stranded DNA (anti-dsDNA) is more likely to be found only in patients with SLE. It may play an important role in injury to blood vessels found in SLE, and high levels often indicate kidney involvement. Anti-dsDNA levels tend to fluctuate over time and may even disappear. Anti-Smith (anti-Sm) antibodies are also usually found only with SLE. Levels are more constant and are more likely to be detected in African American patients. Although many lupus patients may not have this antibody, its presence almost always indicates SLE. When the ANA is negative but the diagnosis is still strongly suspected, a test for anti-Ro (also called anti-SSA) and anti-La (also called anti-SSB) antibodies may identify patients with a rare condition called ANA negative, Ro lupus. These autoantibodies may be involved in the sun-sensitive rashes experienced by patients with SLE and are also found in association with neonatal lupus syndrome, in which a pregnant mother's antibodies cross the placenta and cause inflammation in the developing baby's skin or heart. Some patients with SLE have antiphospholipid antibodies, which increase the risk for blood clots, strokes, and pregnancy complications. If a doctor suspects SLE blood abnormalities, tests may be able to detect the presence of the two major antiphospholipid antibodies: lupus coagulant antibody and anticardioplin antibody. As with the ANA, these antibodies have a tendency to appear and disappear. Patients who have these autoantibodies as well as blood clotting problems or frequent miscarriages are diagnosed with antiphospholipid syndrome (APS), which often occurs in SLE but can also develop independently. Blood tests of patients with SLE often show low levels of serum complement, a group of proteins in the blood that aid the body's infection fighters. Individual proteins are termed by the letter "C" followed by a number. Common complement tests measure C3, C4, C1q, and CH50. Complement levels are especially low if there is kidney involvement or other disease activity. C3 and C4 are commonly ordered to assess lupus activity. 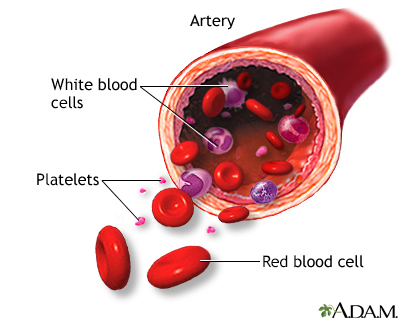 White and red blood cell and platelet counts are usually lower than normal and, depending on severity, are used to determine complications, such as anemia or infection. An erythrocyte sedimentation rate (ESR or sed rate) measures how fast red blood cells (erythrocytes) fall to the bottom of a fine glass tube that is filled with the patient's blood. A high sed rate indicates inflammation. High levels of this blood protein indicate inflammation. Like the ESR, the CRP test cannot tell where the inflammation is located or what is causing it. If a skin rash is present, the doctor may take a biopsy (a tissue sample) from the margin of a skin lesion. A test known as a lupus band detects immunoglobulin G (IgG) antibodies, which are located just below the outer layer of the tissue sample. They are much more likely to be present with active SLE than with inactive disease. Blood tests that measure creatinine, a protein metabolized in muscles and excreted in the urine. High levels suggest kidney damage, although kidney problems can also be present with normal creatinine levels. Urine tests to measure protein levels and to detect urinary cellular casts. Tests for detecting anti-dsDNA antibodies and blood complement levels. All patients who show signs of lupus nephritis should have a kidney biopsy to evaluate and classify the extent of kidney damage. The type and degree of kidney involvement will determine the treatment strategy and the outlook for the patient. Patients who are diagnosed with lupus nephritis should continue to receive urine and blood tests every 1 to 3 months to monitor their condition. Regular blood pressure measurements are also important to ensure that the patient's blood pressure does not go above 130/80 mm Hg. 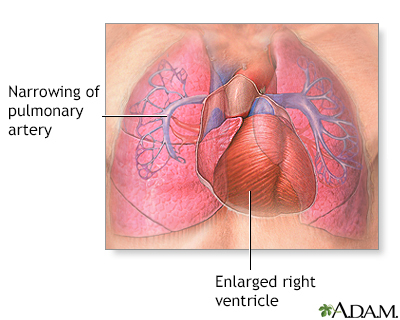 A chest x-ray may be performed to check lung and heart function. 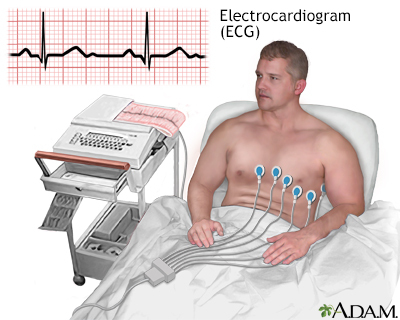 An electrocardiogram and an echocardiogram are administered if heart disease is suspected. No treatment cures SLE, but many therapies can suppress symptoms, relieve discomfort, and improve the outcome. There are also different treatments for the complications associated with lupus. Treatment of SLE varies depending on the extent and severity of the disease. Belimumab (Benlysta) is the newest of these drugs. Belimumab is a biologic monoclonal antibody drug that inhibits a protein called B lymphocyte stimulator. It is given monthly by intravenous infusion in a doctor's office. It is most often used when skin and joint symptoms are not responding the therapy with glucocorticoids and other drugs that suppress the immune system. Other drugs that have not been specifically approved for lupus are also commonly used to treat the condition. Researchers are conducting many investigational drug studies, including trials of new biologic drugs. The main approach to treating severe SLE is to suppress the inflammation and overactive immune system with corticosteroids or immunosuppressant drugs. Other types of medicines, such as drugs to control high blood pressure or elevated cholesterol, may also be prescribed. The major complications of the disease must be treated as separate disorders, keeping in mind the specific aspects of SLE. Disease state at time of conception. Doctors strongly recommend that women wait to conceive until their disease state has been inactive for at least 6 months. Women should make sure that their kidney function is evaluated prior to conception. Poor kidney function can worsen high blood pressure and cause excess protein in the urine. These complications increase the risk for preeclampsia (high blood pressure doing pregnancy) and miscarriage. Patients with severe kidney damage (lupus nephritis) may need to have the baby delivered early. Antiphospholipid and anticardiolipin antibodies can increase the risks for blood clots, preeclampsia, miscarriage, and stillbirths. Anti-SSA and anti-SSB antibodies can increase the risk for neonatal lupus erythematosus, a condition that can cause skin rash and liver and heart damage to the newborn baby. Levels of these antibodies should be tested at the start of pregnancy. Certain medicines (aspirin, heparin) and tests (fetal heart monitoring) may be needed to ensure a safe pregnancy. Women with active disease may need to take low-dose corticosteroids, combined with azathioprine if necessary, but women with inactive disease should avoid these drugs. High doses of steroids can increase a pregnant woman's risks for diabetes and high blood pressure. Pregnant women should not take mycophenolate mofetil (CellCept, generic), cyclophosphamide (Cytoxan, generic), or methotrexate (Rheumatrex, generic) because they can cause birth defects. Steroid creams are often used for skin lesions. However, many patients with cutaneous lupus do not respond to steroids, particularly if they have eruptions that are caused by sun sensitivity. A cream derived from vitamin A (Tegison) may help some lesions that do not clear up with steroid creams. Sun protection is essential. Patients should always use sunblock creams (not just sunscreens) and always wear hats and clothing made of tightly woven fabrics. NSAIDs block prostaglandins, the substances that dilate blood vessels and cause inflammation and pain. They can help relieve joint pain and swelling, muscle pain, fever, and headaches. There are dozens of NSAIDs. Over-the-counter NSAIDs include aspirin, ibuprofen (Motrin, Advil, generic), naproxen (Aleve, generic), ketoprofen (Actron, Orudis KT, generic). Prescription NSAIDs include prescription forms of ibuprofen naproxen and ketoprofen, as well as diclofenac (Voltaren, generic), and tolmetin (Tolectin, generic). Long-term, regular use of NSAIDs (with the exception of aspirin) can increase the risk for heart attack, especially for people who have a heart condition. Long-term use of NSAIDs also increases the risk for ulcers and gastrointestinal bleeding. This risk can be reduced by taking antacid medicines such as omeprazole (Prilosec, generic) along with the NSAID. To reduce the risks associated with NSAIDs, take the lowest dose possible for pain relief. To avoid stomach problems, it is best to take NSAIDs with food or immediately after a meal. Patients who have kidney problems associated with lupus (lupus nephritis) should be especially cautious about using NSAIDs. Patients with lupus who take NSAIDs on a regular basis should have their liver and kidney function tested every 3 to 4 months. 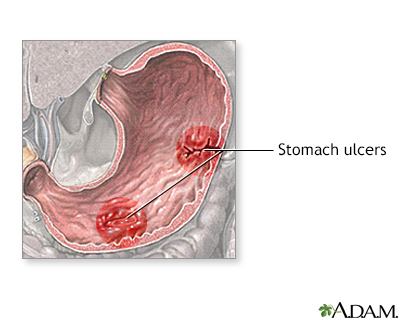 An ulcer is a crater-like lesion on the skin or a mucus membrane, such as the lining of the stomach, caused by an inflammatory, infectious, or malignant condition. Patients can take certain medicines to suppress the acid in the stomach causing the erosion of the stomach lining. Endoscopic therapy can be used to stop bleeding from the ulcer. Hydroxychloroquine (Plaquenil, generic) is the most common antimalarial drug used for lupus. This drug is effective as maintenance therapy to reduce flares in patients with mild or inactive disease. Hydroxychloroquine may help protect against blood clots in people with antiphospholipid syndrome, high cholesterol levels, and bone loss. It is also an important treatment for patients with lupus kidney disease. Other antimalarial drugs include chloroquine (Aralen, generic) or quinacrine (Atabrine, generic). Treatment may start initially with high doses in order to accumulate high levels of the drug in the bloodstream. It is not known exactly why antimalarials work. They may block the immune response or interfere in some way with inflammation. The most serious side effect is damage to the retina, although this is very uncommon at low doses. Eye damage after taking hydroxychloroquine is reversible when caught in time and treated. But it is not reversible if the damage develops after taking chloroquine. An eye exam is advisable when starting the drug and then every year after taking it for more than 5 years. Antimalarials may also be used in combination with other anti-SLE drugs, including immunosuppressants and corticosteroids. It should be noted that smoking significantly reduces the effectiveness of antimalarial drugs. Severe SLE is treated with corticosteroids, also called steroids, which suppress the inflammatory process. Steroids can help relieve many of the complications and symptoms, including anemia and kidney involvement. Oral prednisone (Deltasone, Orasone, generic) is usually prescribed. Other drugs include methylprednisolone (Medrol, Solu-Medrol, generic), hydrocortisone, and dexamethasone (Decadron, generic). Some people need to take oral prednisone for only a short time; others may require it for a long duration. An intravenous administration of methylprednisolone using "pulse" therapy for 3 days can help reduce flare-ups in the joints. Combinations with other drugs, particularly immunosuppressants such as azathioprine, may be beneficial. Regimens vary widely, depending on the severity and location of the disease. Most patients with SLE can eventually function without prednisone, although some may have to choose between the long-term toxicity of corticosteroids and the complications of active disease. In certain situations (for example, at the start of treatment for lupus nephritis), steroids may be given intravenously for a few days. 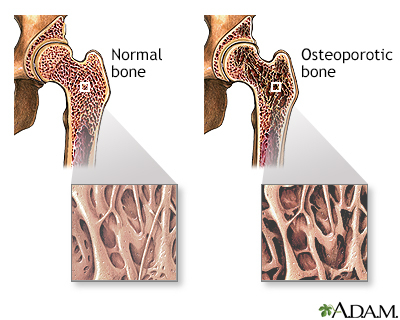 Osteoporosis is a common and particularly severe long-term side effect of prolonged steroid use. Other adverse effects include weight gain, fat deposits, fluid retention and swelling, increased appetite and weight gain, bruising, acne, high blood pressure, cataracts, glaucoma, diabetes, susceptibility to infections, muscle wasting, menstrual irregularities, and mood swings. Long-term use of oral steroid medicines suppresses secretion of natural steroid hormones by the adrenal glands. After withdrawal from these drugs, this adrenal suppression persists and it can take the body a while (sometimes up to a year) to regain its ability to produce natural steroids again. No one should stop taking any steroids without first consulting a doctor, and if steroids are withdrawn, regular follow-up monitoring is necessary. Patients should discuss with their doctors measures for preventing adrenal insufficiency during withdrawal, particularly during stressful times, when the risk increases. Drugs known as immunosuppressants are often used, either alone or with corticosteroids, for very active SLE. Immunosuppressants are particularly recommended when kidney or neurologic involvement or acute blood vessel inflammation is present. These drugs suppress the immune system by damaging cells that grow rapidly, including those that produce antibodies. Cyclosporine (Sandimmune, generic), tacrolimus (Prograf, generic), and methotrexate (Rheumatrex) are other immunosuppressants that are sometimes used. For patients with moderate-to-severe lupus nephritis (class III or IV), either cyclophosphamide or mycophenolate mofetil may be used. Cyclophosphamide is given intravenously. Mycophenolate is given in pill form. Intravenous corticosteroids may also be initially given, followed by oral prednisone for a few weeks. Later treatment may include azathioprine. For patients with more severe (class IV or V) types of lupus nephritis, steroids plus mycophenolate may be considered. For patients with very severe lupus nephritis (class VI), immunosuppressants are of little help and kidney transplantation is the main option. Race makes a difference. During the initial (induction) treatment stages, mycophenolate works better for Hispanic or African American patients whereas cyclophosphamide is best for white patients of European ethnicity. Patients who do not respond to mycophenolate or cyclophosphamide may benefit from the biologic drug rituximab (Rituxan). Studies done to date do not clearly support the benefit of rituximab for SLE. Other biologic drugs, such as Epratuzumab, are also being studied. Other calcineurin inhibitors such as tacrolimus or cyclosporine may also be tried. Belimumab (Benlysta) is a monoclonal antibody drug that is used along with standard lupus drug treatments such as corticosteroids, antimalarials, immunosuppressants, and NSAIDs. The drug works by targeting and reducing the abnormal B cells that are thought to play a role in lupus. Belimumab is given directly into a vein by intravenous infusion. The infusion is given in a doctor's office or other clinical setting and takes about an hour. The patient receives an infusion every 2 weeks for the first three treatments. After that, the patient receives an infusion once every 4 weeks. Studies suggest that belimumab may reduce the likelihood of severe flares and may possibly help patients reduce their doses of steroid medicine. However, in these studies, African Americans and other patients of African descent did not seem to respond to belimumab. Additional studies are being conducted to determine if belimumab is safe and effective for these patients. Belimumab has many side effects. The most common ones are nausea, diarrhea, and fever. Serious side effects may include infections, heart problems, and depression including thoughts of suicide. The drug is very expensive and some insurers may not pay for it. Lupus is a chronic disease, marked by symptom-free periods of remission interrupted by flare-ups of active disease. Lifestyle changes can help you prevent flares and promote better overall physical and emotional health. Avoid excessive exposure to sunlight. Simple preventive measures include using sunblock on your face and wearing hats and other protective clothing. If you smoke, quit. Cigarette smoking is bad for everyone but it causes numerous complications for people with lupus. It greatly increases the risk for infections, heart disease, kidney disease, and blood and vascular problems. It is a major trigger for flares. It is also very important to avoid exposure to secondhand cigarette smoke. Use hypoallergenic skin products including sun blocks, cosmetics, and shampoos. Many people with lupus have skin sensitivities. Avoid stress. Emotional and physical stress can trigger flares. It is also important to get adequate rest, especially during a flare. Patients should be sure they are fully immunized and should minimize their exposure to crowds or people with contagious illnesses. Careful hygiene, including dental hygiene, is also important. Be sure to call your doctor if you have a fever over 100°F (37.7°C) or any sudden signs or symptoms that may indicate an infection. It's important for people with SLE to maintain a healthy diet, especially if the disease has caused problems with high blood pressure, cholesterol, kidney function, or other complications. Discuss with your doctor if you need to make any dietary changes based on your specific health profile. Ask your doctor whether you should take a vitamin D supplement -- many people with lupus have low levels of vitamin D because they need to avoid exposure to sunlight. People with SLE should try to maintain a healthy and active lifestyle. Light-to-moderate exercise, interspersed with rest periods, is good for the heart, helps fight depression and fatigue, and can help keep joints flexible. Chronic stress has profound physical effects and influences the progression of SLE including triggering flares. Getting adequate rest of at least 8 hours and possibly napping during the day may be helpful. Maintaining social relationships and engaging in healthy activities are important for reducing stress and preventing depression and anxiety. Explore exercises that also have a relaxation component (such as yoga and tai chi) and learn more about relaxation techniques such as deep breathing and meditation. Like all chronic illnesses, SLE poses many frustrations and challenges -- physical, emotional, financial, and otherwise. It affects all dimensions of a person's life including work, family, and relationships. It is absolutely normal and natural for patients to feel overwhelmed, especially after first receiving a diagnosis. The more you know about SLE, the better you can manage it. Ask your rheumatologist for reliable resources (websites, national organizations, support groups). Remember that what may be confusing at first will start to make sense. Remind yourself that you will adapt over time. You will get used to the "new normal." You will feel like yourself again as you learn how to fit your illness into your life. Fatigue is common with SLE. Changes in your appearance may affect the way you feel about yourself. Medicines can have side effects. All of these things can take an emotional toll and can deplete your energy. Listen to your body and rest when you need to. Simple activities that relieve stress (going for a walk, spending time with a friend, taking an art class) can help improve your energy and mood. SLE is a frustrating disease to live with and patients often struggle with emotions ranging from grief to anger. Share openly with your doctor any concerns you have about depression or anxiety. Some medicines used to treat lupus may contribute to these conditions. Talk With Others Who Have SLE. Know that you are not alone. You have much to share and learn from others who have this condition and who are going through similar challenges. Your hospital may have a support group. There are also online groups. Build a strong support network among your family and friends. Share your feelings and knowledge about SLE with them. Inform your friends and loved ones how they can specifically help you, whether it is running an errand, doing an activity together, or just being there to listen. Many people are happy to help and are glad to be asked. Bertsias G, Fanouriakis A, Boumpas DT. Treatment of systemic lupus erythematosus. In: Firestein GS, Budd RC, Gabriel SE, McInnes IB, O'Dell JR, eds. Kelley and Firestein's Textbook of Rheumatology. 10th ed. Philadelphia, PA: Elsevier; 2017:chap 81. Crow MK. Etiology and pathogenesis of systemic lupus erythematosus. In: Firestein GS, Budd RC, Gabriel SE, McInnes IB, O'Dell JR, eds. Kelley and Firestein's Textbook of Rheumatology. 10th ed. Philadelphia, PA: Elsevier; 2017:chap 79. Dall'Era M, Wofsky D. Clinical features of systemic lupus erythematosus. In: Firestein GS, Budd RC, Gabriel SE, McInnes IB, O'Dell JR, eds. Kelley and Firestein's Textbook of Rheumatology. 10th ed. Philadelphia, PA: Elsevier; 2017:chap 80. Feldman CH, Costenbader KH. Epidemiology and classification of systemic lupus erythematosus. In: Hochberg MC, Gravallese EM, Silman AJ, Smolen JS, Weinblatt ME, Weisman MH, eds. Rheumatology. 7th ed. Philadelphia, PA: Elsevier; 2019:chap 133. Fischer-Betz R, Specker C. Pregnancy in systemic lupus erythematosus and antiphospholipid syndrome. Best Pract Res Clin Rheumatol. 2017;31(3):397-414. PMID: 29224680 www.ncbi.nlm.nih.gov/pubmed/29224680. Guerreiro CS, Isenberg DA. Belimumab in systemic lupus erythematosus (SLE): evidence-to-date and clinical usefulness. Ther Adv Musculoskelet Dis. 2017;9(3):75-85. PMID: 28344669 www.ncbi.nlm.nih.gov/pubmed/28344669. Hahn BH, McMahon MA, Wilkinson A, et al. American College of Rheumatology guidelines for screening, treatment, and management of lupus nephritis. Arthritis Care Res (Hoboken). 2012;64(6):797-808. PMID: 22556106 www.ncbi.nlm.nih.gov/pubmed/22556106. Jessop S, Whitelaw DA, Grainge MJ, Jayasekera P. Drugs for discoid lupus erythematosus. Cochrane Database Syst Rev. 2017;5:CD002954. PMID: 28476075 www.ncbi.nlm.nih.gov/pubmed/28476075. Kado R. Systemic Lupus erythematosus for primary care. Prim Care. 2018;45(2):257-270. PMID: 29759123 www.ncbi.nlm.nih.gov/pubmed/29759123. Kiriakidou M, Cotton D, Taichman D, Williams S. Systemic lupus erythematosus. Ann Intern Med. 2013;159(7):ITC4-1. PMID: 24081299 www.ncbi.nlm.nih.gov/pubmed/24081299. Lee LA, Werth VP. Lupus erythematosus. In: Bolognia JL, Schaffer JV, Cerroni L, eds. Dermatology. 4th ed. Philadelphia, PA: Elsevier; 2018:chap 41. Olesinska M, Saletra A. Quality of life in systemic lupus erythematosus and its measurement. Reumatologia. 2018;56(1):45-54. PMID: 29686443 www.ncbi.nlm.nih.gov/pubmed/29686443. van Vollenhoven RF, Mosca M, Bertsias G, et al. Treat-to-target in systemic lupus erythematosus: recommendations from an international task force. Ann Rheum Dis. 2014;73(6):958-967. PMID: 24739325 www.ncbi.nlm.nih.gov/pubmed/24739325.